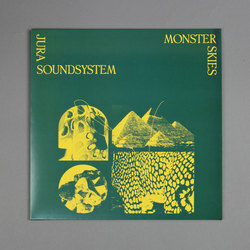 Jura Soundsystem - Monster Skies EP. Vinyl LP. Bleep. After seeing his Isle Of Jura imprint grow nicely over the past couple of years, Kevin Griffiths has recently set up offshoot Temples Of Jura. With the label specialising in original material, it was perhaps only a matter of time until Griffiths’ Jura Soundsystem project put out a solo release through Temples (there has already been a split with Len Leise). Across new EP Monster Skies we find Griffiths blending the dreamy Balearicism of Young Marco’s Safe Trip with cheeky machine funk (‘Boogie Tune’) and New Age-inspired excursions (‘The Lantern Story’).